You can save even more time in Aperture by apply basic image adjustments during the import process. This automation became particularly attractive in version 3.3 with the introduction of Auto Enhance, which never harms a photo, but does a great job of applying subtle adjustments to improve it. Here's how to set up your import to apply Auto Enhance, or any other effect. 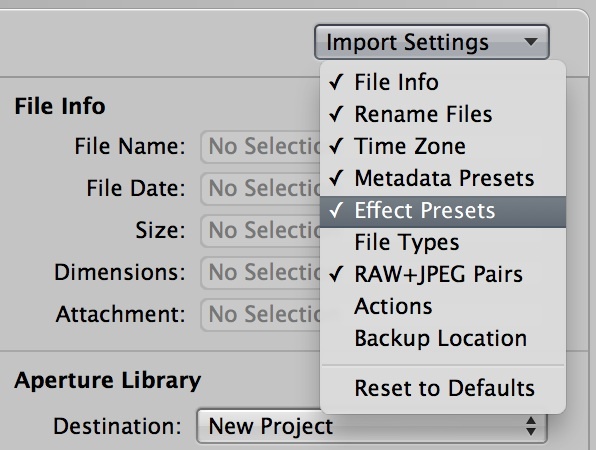 First, make sure that "Effect Presets" is selected from the "Import Settings" popup menu in the Import dialog box. If there's a checkmark next to the name, it's selected and should appear on the right side of the interface. 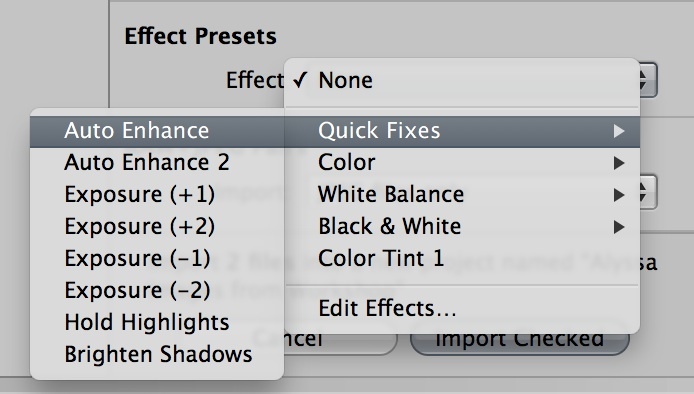 Next, go to the Effects Preset brick in the Import dialog box and choose Quick Fixes > Auto Enhance. Now, when you import your images, Auto Enhance will be applied to each shot. You can fine tune the settings for your favorite shots in the Adjustments tab. My next open Aperture Workshop is scheduled for Nov. 16 & 17 2012, in Santa Rosa, CA. You can get on the pre-registration list, plus learn about all the other photography workshops offered this season by visiting the TDS Workshops page. What to do when you have in your series some bracketing pictures? They all will be changed to the same level I think. What will happen to a bracketed series of pictures? They will all change to the same view guess.